When I was a kid, summer nights at Torch Lake were punctuated by thousands of fireflies. They would parade out of the darkness, exclamation points of soft, warm light marching toward the flickering glow of the campfire. Like sisters, cousins, parents, and grandparents, they seemed to swarm around the perimeter of the fire to share a connection, a story, or a laugh. Perhaps they were drawn to the warmth of the fire, or by the strength of the bonds that developed around that worn out brick circle fire pit. Over the years, the numbers have dwindled…both of family and fireflies. The campfire seems to have let their spirits go, embers adrift on a breeze toward the water. Some losses you kind of expect, like Grandma and Grandpa. Grandparents die; even grade school kids know and accept this. But others come as a surprise. None of us were prepared for Marty’s death. He was one of us. There is comfort in the fact that he died at the lake, but he died in the winter…alone. No fireflies to gather around him and guide his spirit out over the water. Just Marty and his bottle. I suppose we should have seen it coming. ZAP! One soft, warm light extinguished. When we were young, we chased the fireflies around the outside of the brick circle fire pit where our elders gathered, sharing whiskey sours, stories, and laughter. We were filthy and sweaty, but we didn’t care, and the fireflies didn’t seem to mind much either. We would capture them briefly in our small, grubby hands and giggle as they tickled our palms. We never put them in a jar because Tommy, Marty’s younger brother, thought it was cruel, and everyone loved Tommy too much to hurt his feelings. Occasionally the dance with our luminous partners was interrupted when a roar of laughter cut in from the brick circle. Someone had shared a good story. I suspected it was my father, Bob. He learned at Grandpa ‘Kay’s knee that the truth should never get in the way of a good story. We have all come to believe that. These little family traditions endure the passing of fireflies. They endure because they are beyond flesh and bone. They live in the sand, and the flames, and the water. They live in the fabric of Torch Lake. They live in the threads from which the fabric of our lives are woven. It’s these little family customs that wrap around you, a superhero’s cape, protection from the world. Over time, some of the voices around the fire pit have been quieted, or replaced. Grandma and Grandpa ‘Kay passed years ago, but their humor and good nature live on in us, and in our children. The number of chairs by the fire is finite, so one must be vacated for others to join. The perimeter, where the children and fireflies romp is infinite, bound only by the woods and the water. Whiskey sours gave way to boxed wine when my cousins and I moved from the perimeter of the circle to premium fire pit seating years ago. We sat there this summer, laughing and sharing our lives in the days before the celebration of our parents’ birthdays. Aunt Liz, and my mom, Rita, would be 80 this year, and Bob, 85. It was truly a wonderful excuse for a party. We gathered, the cousins and my sisters, around the fire and planned a celebration of lives well lived. Rita, Bob and Liz weren’t at the lake yet, so a few of our children snuck into the circle and tried on their chairs for size. They stayed for a while, but were drawn back to the perimeter by calls from down the lake that promised to be more entertaining than an evening with the old folks. We watched them leave, their flashlights reminiscent of the glow that once punctuated the night when fireflies were abundant. Auntie Liz arrived at last. She took her place by the fire that night and we laughed, and shared, and bonded. We spoke of our year and of the year ahead. We spoke of the past and of the future. We made plans and shared dreams. I found comfort in the filling of the chairs. Only two remained empty. A few days later, Mom called to tell us Dad was in the hospital. They wouldn’t be making the party. They wouldn’t be making the trip out at all this year. That night, after everyone else had wandered off to bed, I found myself staring off into the darkness around the fire in search of fireflies, but there were none. In the distance, I heard the children splashing in the lake, and perhaps the hoot of an owl, but I saw no fireflies. When my focus returned to the fire pit, the empty chairs stared back as if to challenge me. I closed my eyes against the image and tried to imagine this fire without my parents, I tried to imagine this lake without my parents, and I tried to imagine my life without my parents. My eyes closed tight, spilled tears like a slow and steady rain, soaking my cheeks and the front of my shirt. I bowed my head and said a prayer of thanks. Thanks for my family, my life, and this place. When I opened my eyes, I saw, in the distance the faint glow of flashlights and the far away sounds of joyful noise. The kids were headed back from down the lake, their flashlights bouncing through the dark like glow-in-the-dark rubber balls bouncing randomly off one tree and to the next. I took a moment to collect myself and headed toward the cottage. Facing the house, away from the fire, I saw two fireflies dancing by the porch light. 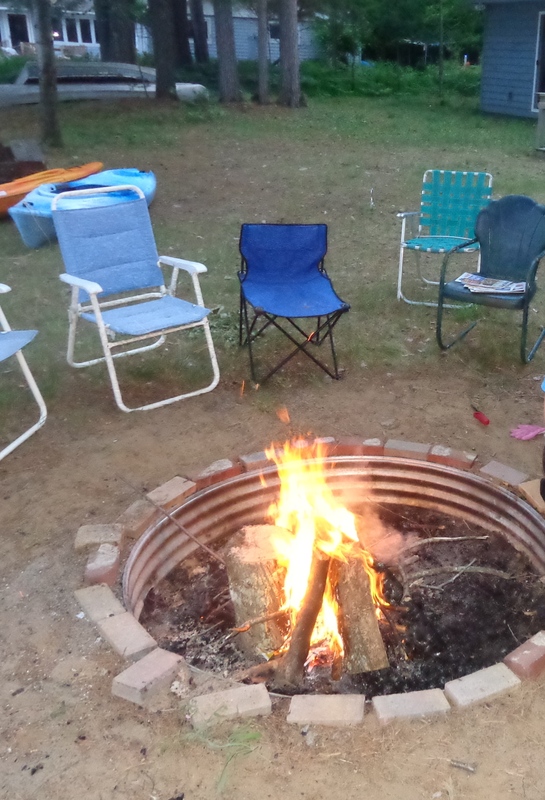 I made my way toward the light and the fireflies, but as I did, I gazed over my shoulder to see our kids laughing, and sharing, and bonding… seated happily in the chairs by the worn out brick circle fire pit. In fairness, you’ve left me weeping.